Learnlight Community enables you to embed Learnlight Tutors in your very own corporate social network. This is far more effective than asking your learners to use an external platform; it increases engagement, leverages pre-existing investments, ensures privacy and security, and contributes additional value to your existing social network. Our tutors will facilitate a range of learning activities based on your company’s industry, latest news and social activity, aimed at improving your employees’ confidence when communicating in writing. Add a Learnlight Tutor to your social network with the permissions that best suit your company’s internal policies. Promote the availability of Learnlight Tutors to your community of learners. Our tutors generate a range of content, discussions and polls based on internal company news and company-specific resources on a daily basis. Learners start to engage with this activity, increasing their exposure to the language being learned, engaging in social and collaborative learning, and linking in to the Learnlight platform for extended learning. Learners looking for an informal social medium in which to improve their language skills. Learners who want to practice interacting with colleagues in the target language. Learners who have a specific need to improve their writing skills. 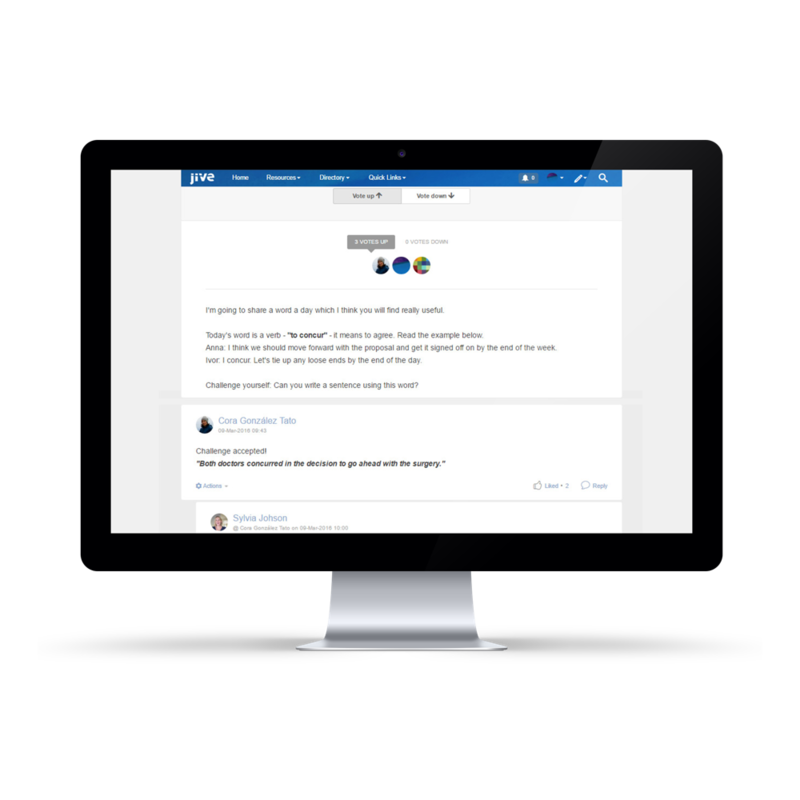 Learnlight Community is available on most typical corporate social networks, including Yammer, Jive, and Chatter. Nurturing and managing a social community requires strict controls around privacy and security. With Learnlight Community you have 100% control: your network, your rules. Instead of waiting for learners to come to us, our tutors go to them, embedding themselves in their world with their tools; a far better way to build learner engagement. Our tutors use internal news, videos, events and trade press articles from your company to drive a range of stimulating and highly relevant learning activities. If you’ve contracted a custom Digital Magazine, Learnlight Community tutors can embed extracts, polls and discussions directly into your social network.